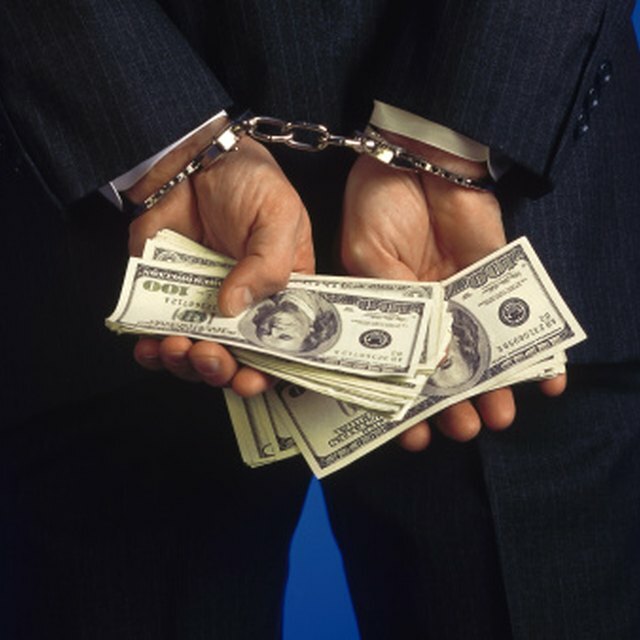 What to Do If an Employee Embezzles? There are few specific laws governing cash handling. Individuals who violate the cash handling procedures delineated in their employment contract might find themselves subject to criminal prosecution or civil liability. Any responsible business that has its employees handling significant amounts of cash will create a document explaining its policy on handling cash. Employees who violate that agreement can be subject to termination or other consequences in more severe situations. Employees who steal cash that doesn't belong to them can be brought up on criminal charges related to larceny or even fraud. If the theft is repeated over a period of time, the penalties can be severe--years in prison. If the thefts total less than the small claims limit for the state in which they occurred, it may not be a criminal matter. If an employee allows the theft of substantial amounts of cash through gross negligence, she can be charged with that crime and terminated from employment. Companies that want to ensure that their employees are legally responsible for errors that they make in regard to cash handling must develop specific cash handling policies. If there is no cash handling policy, it becomes far more challenging to bring up legal or civil charges against an employee who acts negligently or maliciously while handling company funds. Accurate record-keeping is a pillar of a sensible cash handling policy. Without accurate records, it can be impossible to prove what has happened with company assets. Any intake or outtake of money should be recorded in a ledger or spreadsheet close to the time at which it actually happened. Accurate accounting is mandated by local, state and federal law. If the information in the ledger can be independently or automatically confirmed, the chances of fraud or theft escaping detection are reduced. Implementing cash handling procedures is expensive, but it reduces the amount of risk accrued to the business. Conducting business electronically instead of using cash has some expenses--such as credit card charges--but it reduces the need for developing extensive cash handling policies and implementing monitoring procedures. Prosecuting or suing for cash handling errors is rarely a profitable activity for a business, so doing whatever possible to avoid such an eventuality insulates the business from further risk. Educate employees about the importance of following exacting cash handling procedures. Monitor employees for work satisfaction and criminal records if they are involved in cash handling. If possible, assign only employees with a record of responsibility and professionalism to cash handling tasks. Some accounting experience or basic knowledge of the field also increases the chances of legal compliance. BizManuals: How Important Are Cash Policies and Procedures to Your Business?